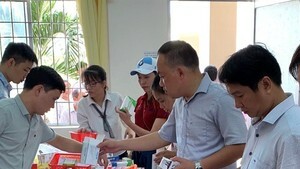 The World Health Organization and Vietnamese Ministry of Health called for stronger commitments from all sectors to “Handle antibiotics with care” during a public advocacy event held yesterday in Ho Chi Minh City. At the event, Momoe Takeuchi from WHO said by Who’s statistics, thousands of people globally die of antibiotic resistance and spends dozens of thousand of dollar on treatment. Because of people suffering antibiotic resitance, they have had longer stay in hospitals and the mortality hs surged, according to WHO’s figures of the number of antibiotic resistance people in 2014 in 114 nations. Though the Southeast Asian country has built a system to control antibiotic from 2013, Vietnam there has been no figure of how many people suffering antibiotic resistance in Vietnam. Rampant sales and purchases of biotic have been taking place especially buying without doctors’ prescription. Most of drug store assisstants in Vietnam don’t ask prescription and 87 percent of residents can buy the medicine from drug store. Vietnam authority needs to tighten control over the medicine responsibly not only in health sector but also in agriculture sector, Ms.Momoe Takeuchi said. Deputy Health Minister Professor Nguyen Truong Son said antibiotic resistance is a major threat to human and Vietnam’s economy because there has been an increase in uncontrolable use of biotic in treating people and animals. Realizing the threat, the Ministry of Health, the Ministry of Agriculture and Rural Development, the Ministry of Industry and Trade and the Ministry of Natural Resources and Environment and other partners signed an agreement on prevention of antibiotic resistance in 2013. Ministries have set up nine inspection teams and supervision network in medical institutions as well as built national action plan on infection for the period 2016-2020 and guidance on using biotic in health facilities. Moreover, ministries implemented precription project and controlled precription to minimize sales of biotic without precription in response to the World Health Organization’s appeal “ No action today, no drug tomorrow”. In spite of the fact that hospitals have established management system over using biotic and reduced wrong use of biotic much, drug stores and private clinics are two places where health watchdog can’t control over precription of rampant biotic, Professor Son said.